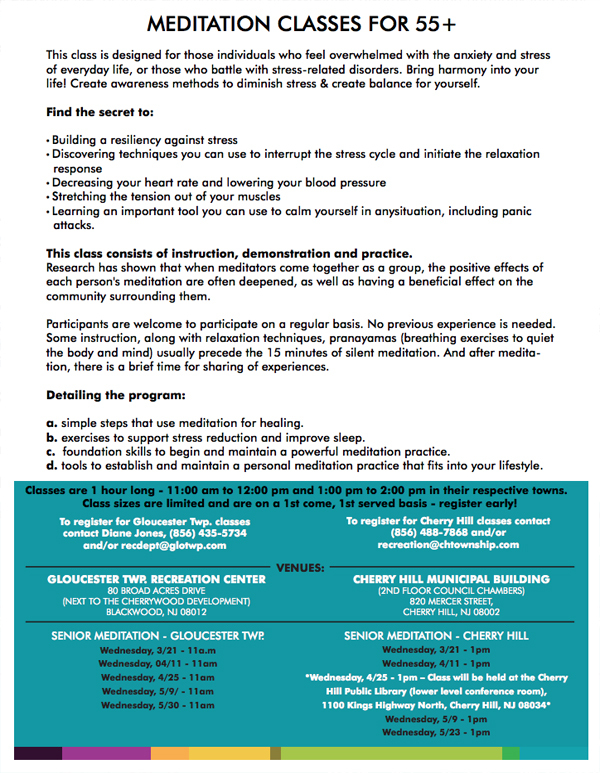 This Meditation Class is designed for those individuals who feel overwhelmed with the anxiety and stress of everyday life, or those who battle with stress-related disorders. Bring harmony into your life! Create awareness methods to diminish stress and create balance for yourself. Participants are welcome to participate on a regular basis. No previous experience needed. Some instruction, along with relaxation techniques, pranayamas (treating exercises to quiet the body and mind) usually precede the 15 minutes of silent meditation. After meditation, there is a brief time for sharing experiences. Classes are 1 hour long in the respective towns. Please check the flyer for specific dates, times, and locations. Classes are limited and are on a first come, first served basis so register early. To register for Gloucester Township classes please contact Fiane Jones at (856) 435-5734 or by email at recdept@glotwp.com.